Junk Car Buyers in Raleigh NC. Prices Auto Parts, Salvage Yard. 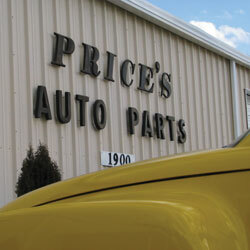 Price's Auto Parts has been serving the automotive industry in the Raleigh, NC area since 1940! With a full service salvage yard offering the highest quality late model auto parts, a junk car buying and auto recycling program, full service paint and body shop and 24 hour auto towing and recovery service, Price's can solve just about any automotive need. Call or visit our website now to find used auto parts, to sell your junk car and for more details about our automotive products and services. Junk Car Buyers NC is part of the Automotiveinet business network. It offers tips and guidance to consumers looking to sell wrecked, salvage or old junked cars for cash as well as offer contact information to the top junk car buyers in NC. Junk car buyers NC is NOT a car broker site and does not charge a fee for referrals. Find junk car buyers in NC, Raleigh, Charlotte, Greensboro, Durham, Cary, Goldsboro, Winston-Salem, Fayetteville, Wilmington, High Point, Greenville, Rocky Mount, Wilson, Burlington, Ashvillle, Wake county and many more geographical areas. Price's Auto Parts, Raleigh NC.